Viking Books for Young Readers, 9780670014309, 40pp. Some tea parties are for grown-ups. But this tea party is for a very special guest. And it is important to follow some rules . . .
especially when their manners are more Cretaceous than gracious . . . 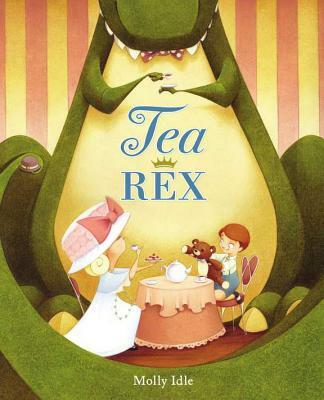 Introducing Tea Rex, a guest that just about any child would love to have to tea! Molly Idle takes her tea with milk (no sugar) and will always accept the offer of a slice of chocolate cake to go with it. Just about any time but tea time, she can be found at her desk pouring over stacks of drawings, or running amok after her two very special boys. She and her family live in Tempe, Arizona.